Prior to armory completion, Troop A rented quarters at Dickel's Riding Academy in the early 1890's located at 136 Est 56th Street. Because this unit was a troop (not a full squadron) at the time of design, it was designed to share a drill shed with the Eighth Regiment Armory on Park Avenue behind and attached to the rear of this facility. 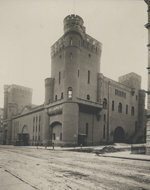 After the Eighth Regiment vacated the attached Park Avenue armory in 1913, Squadron A expanded into that space to occupy both armory buildings.